Clean label mayonnaise was developed in response to supermarket requirements for the removal of E numbers from product ingredient lists. Retailers are increasingly demanding products which are manufactured using ‘kitchen cupboard’ ingredients. Clean label starches are very popular as a mayonnaise additive. But starch often needs to be heated unlike the instant starches used in mayonnaise manufacture. Once swollen, starch has very fragile cell walls, which can be easily burst by the high shear conditions applied in mayonnaise to reduce oil globule size. Production techniques therefore need to be altered and other components used to reduce the effect of the shear on the starch. We can help you develop new clean label mayonnaise recipes which will satisfy the demands of your retail customers and consumers. 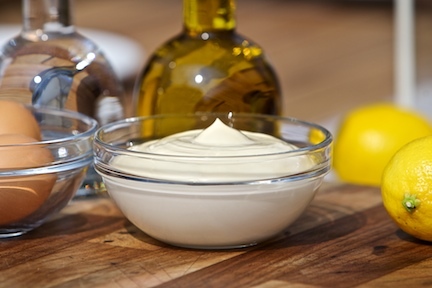 We can show you how to effectively use starch alternatives as a thickener in your mayonnaise products, which means fewer or no ‘e numbers’ in your ingredients list. However, our approach is also based on introducing other ingredients in addition to starches to ensure viscosity and mouthfeel is maintained. When native starch is used in isolation in lower oil recipes high dosages are needed to achieve viscosity. This can give rise to a sticky, claggy mouthfeel because the starch granule struggles to survive the harsh rotor/stator shear conditions. Other ingredients are required to introduce viscosity and lubrication and a slower rate of swell. Other starches with different grain sizes or, indeed, molecular size can also be used to create a ball bearing like slipperiness and provide enhanced creaminess to the granule. Alternatively, pectin can also be used. Because of its use in jam making, pectin is regarded as a ‘kitchen cupboard’ ingredient. If used in mayonnaise it should be conventional rather than amidated as this is not used for jam. Contact us for advice on the production of your new product. There are a number of problems which can arise when producing mayonnaise to ‘clean label’ specifications. We can help you find the solutions. Using high doses of starch has dramatic effects on water uptake – sometimes to the point where the recipe becomes water starved and unable to actually make an emulsion. More generally, an emulsion with poor stability is made. We can show you how to overcome this by examining the rate of swell, the type of starches used and any supplementary stabilisers. We can also look at where the components are added during the production cycle. Starch based mayonnaise is unable to withstand the effects of the enzyme present in raw vegetables. This can impact on the final use of the mayonnaise in sandwiches, sandwich fillers, pasta dishes and layered salads. The best point to add starch: before, or after, other components. Adding hydrocolloids is the most widely used method of producing cost effective mayonnaise. However, this doesn’t help if you are looking to produce a ‘clean label’ mayonnaise, which is not likely to be cheaper. Keeping costs down when using starches is more difficult. At KaTech we can advise you on how to minimise costly starch use. The trick is to avoid shear damage as much as possible – because it is this shear damage, and subsequent loss of viscosity, which results in the addition of more starch to compensate. And that can cost you more.